All classes are by appointment only, prepaid, non-refundable and you cannot change your date or reschedule. Sorry, because of no call, no shows we had to institute this policy. 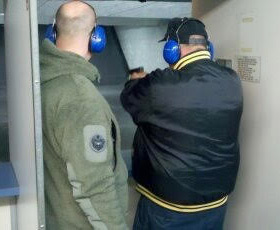 This class is required by Oregon for application of the license to carry a concealed handgun. $30 per student, pre-payment required, no walk-ins. This class is for beginners. You’ll learn safety and how to properly load and fire a modern handgun. Bring your gun or we’ll supply one. 50 rounds of ammo is not included in the cost of the class and must be purchased separately. Every Saturday and Sunday in one hour blocks. Call to schedule. $50 per student plus ammo. This class is for members needing a touch up on the fundamentals. Can you shoot a “one hole” group? If not, we can help! This class is for folks who have taken Basic One and are ready for the next step. Also, if you know how to shoot and need some professional help to get better this class is perfect. . Basic 2 is a drill set where the class is broken down into 3 sets. Set #1 Sighted and Non-sighted fire. Set #2 Trigger Control. Set #3 Speed and accuracy. These sets are given in 1 hours blocks and cost $25 for each set. It will require 100 rounds of ammunition. Please call during business hours for an appointment. If you know how to load and unload, be safe with your gun and can hit a pie plate at 10 feet you’re ready for a defensive class. This class is all about moving and shooting! 150 rounds of ammo is not included in the cost of the class and must be purchased separately. Note: Upon completion of DH2 a current member is qualified to rent the Tactical Training Range on an hourly base. Talk to our instructor Rich for details.